Adrenaline junkies will love this experience. Fantasticables are joyrides where you're strung to a metal wire and fly between mountaintops in a glorified baby carrier 1200 feet off the ground! Using gravity to hurtle you head first over the valley floor at up to 70 mph, the Fantasticable rides in Italy or France will make you scream with joy. Or fear... 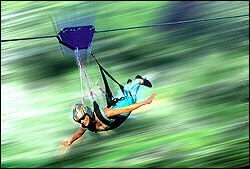 It's the newest extreme sport to hit the limelight and brings valuable tourist dollars to some new areas of Europe. I'd love to try one of these thrill rides. The newest death slide is installed in Southern Italy and there are currently four in France. Two more are built by Fantasticable in Portugal and Russia. Take a look at the end of the article for details and links to the rides. Words really can't do this extreme sport justice, so check out the video! If you can't see the video in your eyeflare.com RSS feed, click through to eyeflare.com. The Volo dell'Angelo is built in Italy, between the towns of Pietrapertosa and Castelmezzano, in the Basilicata province. The nearest airport is either Napoli (NAP), Naples in English, on the Bay of Naples, or Bari (BRI) on the Adriatic Coast. The ride is about Euro 30, and as one British tourist put it: "Amazing to watch, let alone go on." Châtel, France. You can book this ride to fly over the village of Plaine Dranse via Châtel Tour for Euro 34. There are actually two cables installed in Châtel and the ticket covers both of them. Châtel is near Geneva in Switzerland and across from Lausanne over Lake Geneva. Travelers going to Europe who decide to stay in Geneva and want to make their trip a memorable one should look into taking a fantasticable ride. La Bresse, France. The Bol d'Air Fantasticable installation in the French Alps near Strassbourg or Stüttgart is 1,300 meters long (nearly 4,000 feet) and reaches 75 mph during the 1 minute flight. Fantasticable fliers can be as young as 7 years and 30kg light or as old as 77 years and up to 120kg of weight. The price is Euro 25 per person with group discounts available. The installation in La Bresse will open on 23 June 2007. Haybes-Fumay, France, is located in the heart of the Ardennes mountain range at Pointe de Givet, near the Belgian border. The nearest main airport is Charleroi (CRL) in Belgium, which is the southern airport of Brussels. The Haybes-Fumay Fantasticable is 1,159 meters long (3,400 feet) and lets you fly 350 feet over the landscape of Fumay village at a speed of up to 70 mph. Individual tickets are Euro 23 or group tickets can be bought for Euro 20 per person. More information is available at the Valdardenne Tourism site or Fumay's Aventure Parc.fr page. Both of those sites are in French. Ribeira de Pena is located in the north-east of Portugal, in the mountains 80 miles from the Spanish border. The Fantasticable will open on 15 July 2008 and will be open between 10am and 8pm every day in high season, weekends only outside of the tourist season. The cable here is quite long at 1,550 meters (4,650 feet) and is 150 m above the ground (500 feet). You'll hit 80 mph as you fly down this death slide! Ticket prices are Euro 20. More information and reservation at the Pena Aventura website. The nearest airport is Porto (OPO) and then you'll need to drive up into the Portuguese mountains to reach Ribeira de Pena. No details on the installation in Russia yet, if you know anything about this one, please leave details in a comment! Last updated by jack on 21 March, 2015 in Travel.